(Nanowerk News) Researchers have developed tiny, diamond-based probes that optically transmit detailed temperature information and can operate in conditions ranging from 150 to 850 degrees Kelvin, representing near-cryogenic cold to slightly below the melting point of aluminum. Described in the journal Applied Physics Letters ("Diamond contact-less micrometric temperature sensors"), from AIP Publishing, the probes could be used to measure materials' thermal fluctuations to better understand phenomena like friction and thermoelectricity. The probes may also be used to study temperature in biological systems, since diamond is biocompatible, and on a longer timescale, they might replace other sensors used in industry to monitor extreme environments like the inside of engines, combustion chambers, and high voltage systems. 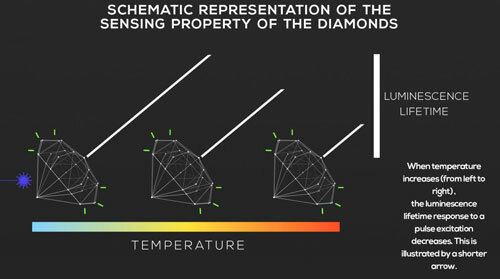 'Although its structure seems complicated, it is a very common defect of diamond and, in particular, of artificial diamonds, since nickel is widely used as a synthesis precursor,' said Gilles Ledoux, a CNRS (French National Center for Scientific Research) researcher at the Institute of Light and Matter at the University of Lyon in France. The team tested the probes by attaching micro-diamonds with Ni-based S3 defect centers on silicon and inserting them into a cryostat, a piece of equipment that could control the temperature from 77 degrees Kelvin (minus 196 degrees Celsius/ minus 321 degrees Fahrenheit) up to 873 Kelvin (600 degrees Celsius/1,112 degrees Fahrenheit). The best results exhibited an accuracy of better than 1 degree Celsius. 'This sensor combines good sensitivity, fast response speed, a huge range of use, from 150 degrees Kelvin to 850 Kelvin, and a potentially good spatial resolution, only limited by the size of the diamond particles,' said Estelle Homeyer, another member of the research team. 'For each of these criteria one can find a slightly better [sensor] candidate, but none that can combine all of them,' she said.